DML continues to “complete the record” on T-34s and now is offering this kit of the Model 1943 with commander’s cupola. While the tank still only had a four man crew, the addition of the cupola provided the commander with much needed capability to observe the battlefield. This kit combines parts from the T-34 Model 1942 “Soft Edge” turret kit (No. 6462) and their T-34-85 kits along with a few new bits such as the cupola to create a kit of the Model 1943. As a result, it uses a full set of the “six spoke” or “twelve hole” (modelers’ terms) cast wheels with perforated rubber tires. 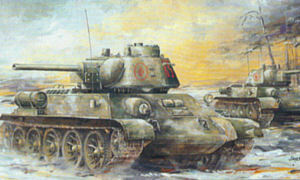 The turret is the generic T-34 Model 1942 but with the molds modified to provide a mounting for the commander’s cupola. While the profile of the cast turret appears closest to that from Uralmashzavod, this time DML has designated a “Factory No. 183" tank., As I noted previously I’ve never really been able to find out how many of the six-sided “hex nut” or “Gayka” turreted tanks were built, but a good estimate would be about 16,000 and another 3,000 with the commander’s cupola. The kit adds several new sprues to the latest set of the molds and provides the cast wheels, cast wheels with rubber tires, new stern plate, new radiator exhaust grilles, and the turret and detail components. The shapes and angles match the Russian plans of the tank I have on hand. A new set of 500mm “waffle” tracks are provided in the form of a new set of “Magic Link” single link tracks, but for reasons best known to themselves this time DML has added four more sets of links. Each link does come with two ejection pin marks on the inner face, but these stand proud and while tedious are easily removed. The model comes with a standard PT periscopic sight/viewer with the “acorn” shaped cover found on most T-34s. The modeler has a choice of but one barrel for the F-34 gun: a one-piece item with hollow bore from “slide” molding and muzzle cap molded in place. A gun breech and partial interior to the turret are provided as with all of the DML T-34 kits. Note that this kit also comes with the ATO-42 flamethrower head (sprue U) as an option for the bow DT machine gun. Four different finishing options are provided: 109th Tank Brigade, 16th Tank Corps, Ukraine 1943 (partial whitewash over 4BO green, red diamond K 4 and K-5 on rear of turret); 8th Estonian Rifle Corps, 3rd Baltic Front, Tallin Operation 1944 (“Za Sovetskuyu Estoniyu”); Unidentified Unit, Poland 1945 (faded whitewash on turret, 4BO green, white 241); 1st Czechoslovakian Armored Brigade, USSR, Prague 1945 (4BO green with Czech roundel and white 421). A targeted set of Cartograf decals are provided. Overall, this is a great improvement over the Tamiya kit with a correct size cupola and once more should be quite popular.